POEditor's Automatic Translation feature allows you to use the translation engine from Google or Microsoft Translate to translate terms in your POEditor software localization project. Who has access to the Automatic Translation feature? All POEditor accounts, paid or free, have the Automatic Translation feature integrated. On a project level, it can be accessed by owners and admins. Contributors can also access it if the owner or an admin grants them access by going to Project Settings and setting Automatic Translation to Everyone in Advanced Settings. The AT uses Google or Microsoft Translate characters to translate strings in POEditor projects. All accounts on POEditor come with 10 000 complementary AT characters, but, since Google and Microsoft Translate characters are not free of charge, if you need more, you will have to go to Account Settings > Profile > Automatic Translations Characters Left and then press the I need more link, where you can purchase one of our available packages. The AT feature only completes the singular forms of the empty translation fields, and does not touch the already localized strings. In any language page, click in the side menu on the Automatic Translation button. 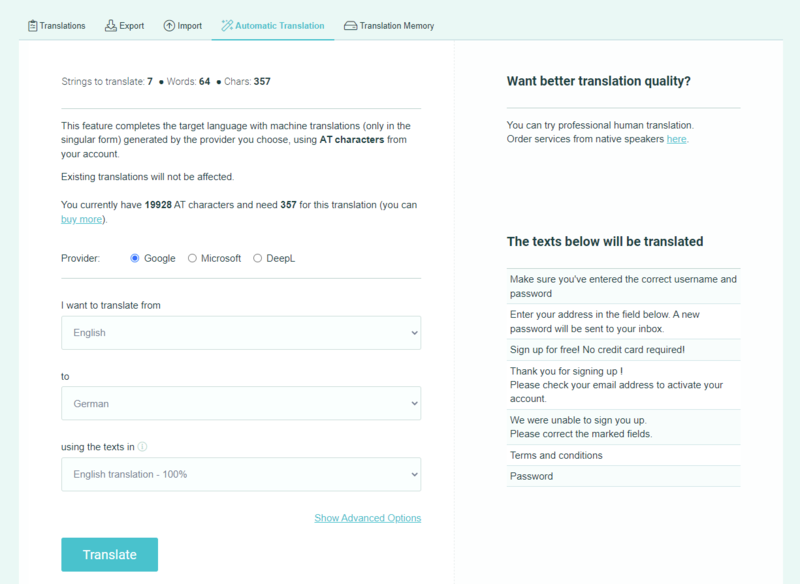 Then select the source in your project (the strings you want to translate), tell the translation engine what language they're in (Translate from) and in what language you want them translated (Translate to). Do not set Project Terms as Source when using Automatic Translation in projects with labels! If you do, you will end up translating the labels. Choose any other option from the languages available.